Ok In this thread, we will talk about movies. If it is movies we've seen or movies that we want to see or movies that wil come soon. OK I'll start. I've justed wathed the two trailers for the second transformers movie called: Revenge of the falen. the movie looks really good and I can't wait until it comes out on DVD. Saw Star Trek yesterday. If you're a narrow-minded Treky that refuses any innovation from the original Star Trek, don't go see it because you're be upset with it, otherwise it was really good. Edited by Totoro at 20:14, 21 May 2009. I hate Star Trek because it is retarded. PS. Master Windu has the best lightsaber imo. nobody in this post disagrees. I saw Star Trek this weekend. Overall I liked it well enough. My only complaint was that the story didn't have much food for thought. It was basically just an action movie. If you're ok with that, you'll probably love the movie. Also, I wish that script writers these days could come up with a main plotline that didn't revolve around (A) revenge or (B) time travel. Can't they come up with anything more original?? I give it 3.5 stars (out of 5). Edited by blizzardboy at 20:26, 26 May 2009. Come now Corribus. There was a powerful message of friendship in the movie and how two people, though they stand so far apart in personalities and views, can forge a powerful relationship. I loved the interaction between Spock and Kirk throughout the movie. It's really hard to be original when everything has already been thought of and been executed better in the past. Edited by Corribus at 21:17, 26 May 2009. I guess, but the characters didn't really ring any chords with me. I'm not saying the acting wasn't good - it was. It's just that I found all the special effects and big-bang action scenes overshadowed the human element that usually takes the front seat in Star Trek. Also (and probably because of this due to the scant amount of time dedicated to emotional dialogue), the change in the relationship between Kirk and Spock was so fast that I almost got whiplash. In one scene Spock is beating the absolute crap out of Kirk on the bridge - after he (Spock) nearly kills Kirk by dumping him (Kirk) onto a cold planet on the middle of nowhere; and 3 minutes later they're best friends out to save the world. Real relationships rarely work that way. The message could have been a good one, but the writers were more interested in using their film footage to show space battles, so that not enough screen time remained to make the development of that relationship believable. 105 minutes - look at all these awesome space battles, fist fights, and special effects. 15 minutes - by the way Kirk and Spock suddenly become great friends even though they hated each other up until a minute ago. Another thing was that Kirk's rise through the ranks was almost too rapid to be believable. I found it kind of hard to believe that a flagship has a single officer on it over the age of 30. I know, that's just nitpicking. I'm making it sound like I didn't like the movie. Yeah, I think it was enjoyable, worth seeing it in the theater. But, like most of the Trek movies, I liked the TV shows better. It's impossible to be completely original. But it seems that almost every sci-fi movie/tv show these days revolves around some time travel conceit. Lost, Heroes, etc., etc. The paradoxes drive me nuts. Edited by Nebdar at 12:03, 26 Jun 2009. And i'm not dissapointed, in fact I think that this part is much better then it previous one. More More DEFINETLY MORE special effects and exploisions, new weapons, there is of course an romantic twist, comedy or parody parts, unsusspected twists of action. Above else this is a great movie as an entartianment. The all fans of the TRansformers will love it. the action of the movie is fast fast fast all the time the poor Witwicky has to have good loungs and body from iron if he can ressist all that punishmetn and still walking. The movie will surely battle for the Oscar in special effects category. I thought there were already a view movie threads that are kinda recent. I've yet to see Star Trek yet and quite frankly, I don't even want to. 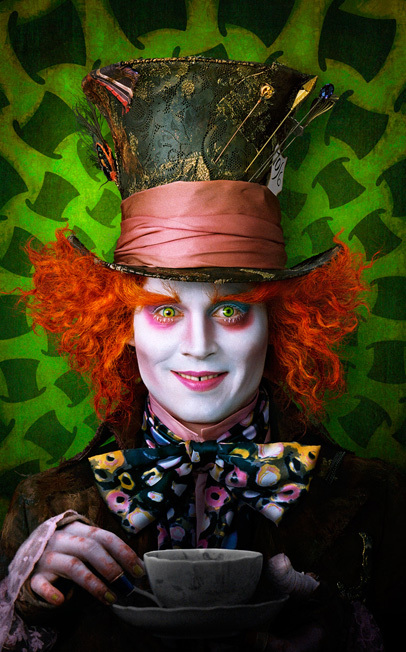 Tim Burton is making Alice (in Wonderland) staring Johnny Depp. Alc, you have just posted one of the scariest faces known to man! in the mean time, I saw the Hangover. it was an alright distraction, but not really that good. Edited by VokialBG at 10:38, 26 Jun 2009. Doomsday is one of the stupidest movies I every watched! Looking forward to Alice, so very promising. After what he did to Charlie And The Chocolate Factory, this is going to be epic! He will also be returning for a fourth pirates of the Caribbean as was hinted in the end of the third. It is unlikely that Turner and Swan will be in but Barbossa is a certain bet, liked Geoffrey Rush I am a bit hesitant in that it looks like they are milking the franchise but as long as Depp is in it can't go wrong At the very worst it is going to be entertaining. I am ashamed to admit I did not yet watch the new chocolate factory I should watch the original again sometime, loved it as a kid.